The pineal gland was the last endocrine gland to have its function discovered. Its location deep in the brain seemed to indicate its importance. This combination led to its being a “mystery” gland with myth, superstition and even metaphysical theories surrounding its perceived function. The Pineal gland is occasionally associated with the sixth Chakra (also called Ajna or the third eye Chakra in yoga). It is believed by some to be a dormant organ that can be awakened to enable “telepathic” communication. In the physical body the eye views objects upside down. 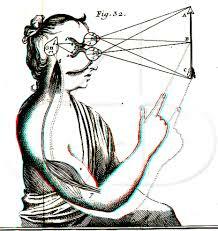 It sends the image of what it observes to the brain which interprets the image and makes it appear right side-up to us. It is located in the geometric center of the brain. This correlates to the location of the Great Pyramid in the center of the physical planet. The Pineal Gland is about the size of a pea, and is in the center of the brain in a tiny cave behind and above the pituitary gland which lies a little behind the root of the nose. It is located directly behind the eyes, attached to the third ventricle. The true function of this mysterious gland has long been contemplated by philosophers and Spiritual Adepts. Ancient Greeks believed the Pineal gland to be our connection to the Realms of Thought. Rene Descartes called it the Seat of the Soul, believing it is unique in the anatomy of the human brain in being a structure not duplicated on the right and left sides. This observation is not true, however; under a microscope one finds the Pineal gland is divided into two fine hemispheres. This gland is activated by Light, and it controls the various biorhythms of the body. It works in harmony with the hypothalamus gland which directs the body’s thirst, hunger, sexual desire and the biological clock that determines our aging process. When the Pineal gland awakens one feels a pressure at the base of the brain. This pressure will often be experienced when connecting to higher frequency. A head injury can also activate the Third Eye – Pineal Gland. There is a pathway from the retinas to the hypothalamus called the retinohypothalamic tract. It brings information about light and dark cycles to a region of the hypothalamus called the suprachiasmatic nucleus(SCN). From the SCN, nerve impulses travel via the pineal nerve (sympathetic nervous system) to the pineal gland. These impulses inhibit the production of melatonin. When these impulses stop (at night, when light no longer stimulates the hypothalamus), pineal inhibition ceases and melatonin is released. The pineal gland is therefore a photosensitive organ and an important timekeeper for the human body. Retinal research done with hamsters demonstrates another center for melatonin production. Located in the retina, this center implies that the eyes have their own built in circadian timepiece. This retinal system is distinct from the brains body clock in the suprachiasmatic nucleus (SCN). Biologists found that they could throw the retinal rhythms out of sync with other circadian cycles. They also found that they could set and reset the retinal clock even when the SCN was destroyed. The retinal clock produces (stimulates the production of?) melatonin. Researchers are now looking for the exact location (s) of this clock in the human eye (and expect to find it). No one yet knows what the separate clock is for or how it relates to the SCN. In some lower vertebrates the Epiphysis Cerebri – Pineal Gland – has a well-developed eye-like structure; in others though not organized as an eye, if functions as a light receptor. In lower vertebrates, the pineal gland has an eye like structure and it functions as a light receptor and is considered by some to be the evolutionary forerunner of the modern eye. 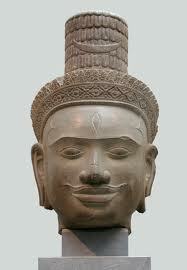 A Cambodian Shiva head showing a third eye – Click to Enlarge. The gland weighs little more than 0.1 gram. The gland is large in children and begins to shrink with the onset of puberty. It appears to play a major role in sexual development, hibernation in animals, metabolism, and seasonal breeding. In humans it affects circadian rhythms, sleep patterns (melatonin levels increase at night), and is implicated in seasonal affective disorder. The abundant melatonin levels in children is believed to inhibit sexual development. When puberty arrives, melatonin production is reduced. The pineal gland secretes melanin during times of relaxation and visualization. As we are created by electromagnetic energy – and react to EM energy stimuli around us – so does the pineal gland. When activated, the pineal gland becomes the line of communication with the higher planes. The crown chakra reaches down until its vortex touches the pineal gland. Prana, or pure energy, is received through this energy center in the head. With Practice the vibration level of the astral body is raised, allowing it to separate from the physical. To activate the ‘third eye’ and perceive higher dimensions, the pineal gland and the pituitary body must vibrate in unison, which is achieved through meditation and/or relaxation. When a correct relationship is established between personality, operating through the pituitary body, and the soul, operating through the pineal gland, a magnetic field is created. The negative and positive forces interact and become strong enough to create the ‘light in the head.’ With this ‘light in the head’ activated, astral projectors can withdraw themselves from the body, carrying the light with them. Astral travel, and other occult abilities, are closely associated with the development of the ‘light in the head’. After physical relaxation, concentration upon the pineal gland is achieved by staring at a point in the middle of the forehead. Without straining the muscles of the eye, this will activate the pineal gland and the ‘third eye’. Beginning with the withdrawal of the senses and the physical consciousness, the consciousness is centered in the region of the pineal gland. The perceptive faculty and the point of realization are centralized in the area between the middle of the forehead and the pineal gland. The trick is to visualize, very intently, the subtle body escaping through the trap door of the brain. A popping sound may occur at the time separation of the astral body in the area of the pineal gland. Visualization exercises are the first step in directing the energies in our inner systems to activate the ‘third eye’. The magnetic field is created around the pineal gland, by focusing the mind on the midway point between the pineal gland and the pituitary body. The creative imagination visualizes something, and the thought energy of the mind gives life and direction to this form. ‘Third eye’ development, imagination, and visualization are important ingredients in many methods to separate from the physical form. Intuition is also achieved through ‘third eye’ development. Knowledge and memory of the astral plane are not registered in full waking consciousness until the intuition becomes strong enough. Flashes of intuition come with increasing consistency as the ‘third eye’ as activated to a greater degree, through practice. The pineal gland corresponds with divine thought after being touched by the vibrating light of Kundalini. Kundalini starts its ascent towards the head center after responding to the vibrations from the ‘light in the head.’ The light is located at the top of the sutratma, or ‘soul thread’, which passes down from the highest plane of our being into the physical vehicle. The ‘third eye,’ or ‘eye of Siva,’ the organ of spiritual vision, is intimately related to karma, as we become more spiritual in the natural course of evolution. As human beings continue to evolve further out of matter, on the journey from spirit to matter back to spirit, the pineal gland will continue to rise from its state of age-long dormancy, bringing back to humanity astral capacities and spiritual abilities. At certain brainwave frequencies, a sense of ego boundary vanishes. In the theta state, we are resting deeply and still conscious, at the threshold of drifting away from or back into conscious awareness. As the brain enters deeper states, our consciousness is less concerned with the physical state, our ‘third eye’ is active, and separation becomes natural. Many native traditions and mystical practices refer to the ability of ‘seeing,’ or being aware of energy fields at higher levels. This abstract awareness is much more subjective and does not involve the normal level of mundane consciousness, which is mostly concerned with self-identity. This ‘seeing’ refers to the sight of the ‘third eye’.